CostFact provides a uniform system base for calculating projects and consolidates information from external systems. Calculations from spreadsheet programs can be imported using CostFact’s “copy & paste” function. The export of calculation projects is possible using different file types. The easy integration of CostFact into the existing system landscape enables the trouble free exchange of data between the different systems, and ensures that no double entries are necessary after implementing the new software. During ship production, CostFact can be used for real-time calculations. The actual data can be imported from other systems via manual control, or by using a completely automatic interchange running in the background. Different building group systems can be administered by CostFact, including general and yard-specific systems. Calculations can be transferred automatically from one system to another. Incorporation of technical parameters for cost prognoses and project comparisons, see Parametric Cost Estimation. 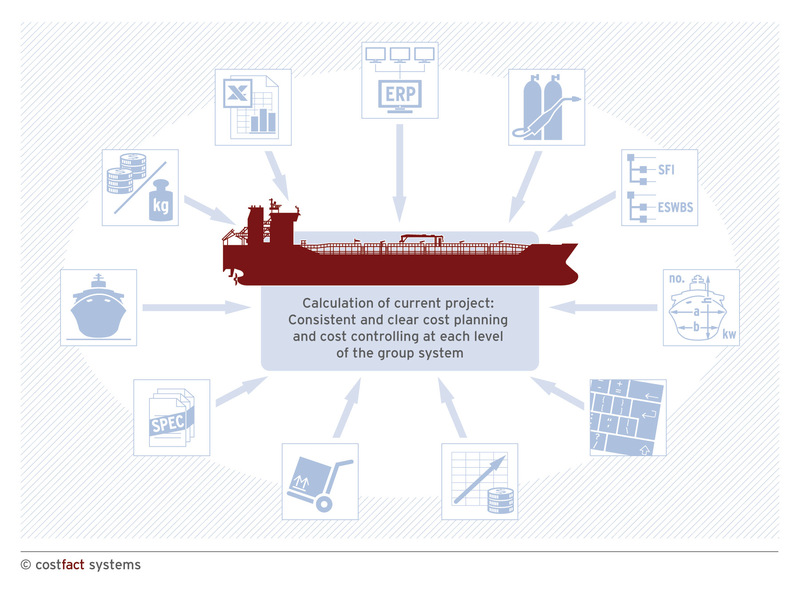 Manual inputs of cost items and quantities are possible at each level of the group system, according to the information that is available at the current stage of the project. Cost factors can be used to update historical calculations or proposals from suppliers, either manually or automatically, based on the time difference and determined price increases over time. Escalations can be carried out in many different ways for selected groups and cost classes. Overhead costs or cost savings when building a ship programme can also be taken into account. Supplier proposals are entered as project related, and one has the option of integrating them into the calculation. All proposals are utilized automatically across existing and new projects. This enables all existing proposals to be used for cost estimates in the current calculations, and the length of time before a first cost indication is available can be reduced by approximately 95%. The module “Specification” supports ship design that corresponds exactly to the specification. It includes functions like generating and using text modules, importing specifications from Microsoft Word documents and automatic consistency checks by identifying costs for which no specifications have been defined (and vice versa). All cost information from previous projects is available for reuse in new projects. New projects can be drawn up by using existing calculations as templates, or by collecting single groups with similarities to the new solution from existing projects, and inserting them into the new project. Cost rates for labour and materials can be defined on a project-related basis. Besides the easy use of current rates in the calculation, automatic updates to the overall calculation are possible even for the purpose of scenario analysis. Additionally, the quantity of the respective cost items can be shown simultaneously in the cost view (such as a quantity of steel, squared meter teak, engineering hours, etc. ).